For Day 4's giveaway, we have here a few Benefit goodies, including CORALista Ultra Plush Lip Gloss, Stay Flawless 15-Hour Primer, and They're Real Mascara! I chose their best selling They're Real mascara because it seems to have become a favourite of many (I have a few tubes as back up too). 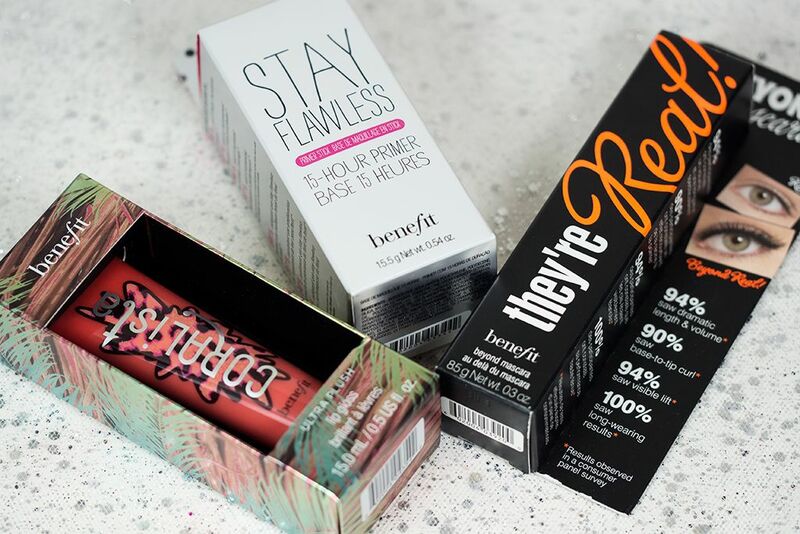 The Stay Flawless primer is great for covering pores and extending the wear of your foundation (reviewed here). And I just adore the Ultra Plush Lip Gloss formula as much as a non-gloss girl I am! This giveaway is opened till January 13, 2014 11:59PM EST. Good luck! I would LOVE to get a Benefit Advent Calendar! Do you know if they're available for purchase? Probably not this year but maybe next year? long time I want to try these masks! I was surprised how much I like it too! It's been such a hit! I hope they do that again! Such a great and cute advent calendar! i love the Quince... such a fun color... ^_^ nice packaging too! does the color last long? is it like a lip stain? I love this type of advent calendar! Sadly the Benefit one isn't available in my country! I would've love to get it! i think i would ♥ to try the GlamGlow Youthmud Tinglexfoliate Treatment... i'm just curious with the Tinglexfoliate thing.